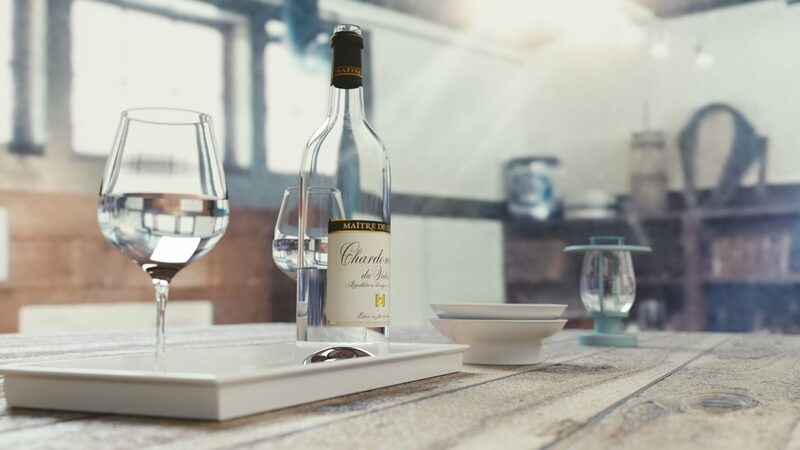 Whether you are a long-time wine connoisseur or you just enjoy an occasional glass of wine, it is imperative to invest in proper wine storage. If you have the space, you could have a wine cooler installed. However, not everyone has the space to keep a large wine cooler. In such a case, you will find out that in-built wine coolers come in handy. Built in wine coolers have been designed to slide under counters between kitchen cabinets, thus saving up a lot of space. 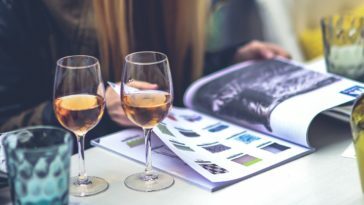 Since wine is considered “living” because chemical processes remain active inside the bottle, it is critical to create an environment that is conducive for maturity. A wine cooler is the perfect environment. 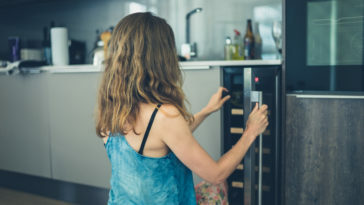 A wine cooler is different from a standard fridge, which means that picking the best could be a way of bringing functionality and elegance into your home. 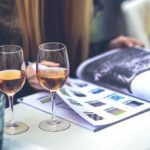 If you are serious about improving the quality of your wine, therefore, check out our review of 3 of the best integrated wine coolers to help you identify the ideal built in wine fridge for you. 55 degrees is the temperature that should be steady for optimum taste. Low temperatures slow down maturation, something that leads to uneven chemical reactions. Higher temperatures, on the other hand, hurry the maturation process, which results in bitter wine. 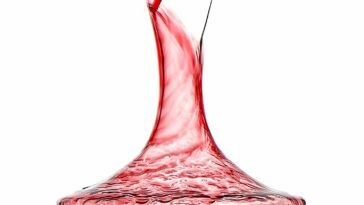 Sunlight can react with the phenolic compounds found in wine. The bottle’s glass cannot keep the rays out but the glass on a wine cooler can. 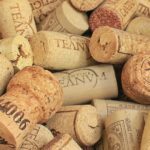 The cork on a wine bottle protects if from outer elements. It is made from organic materials and needs to be kept healthy. 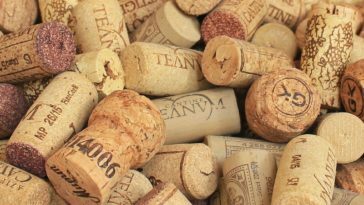 Humidity will keep the cork wet, which prevents the wine from evaporating and external elements from getting into the wine. Smart home design: with the upcoming trends in the home construction industry, people are seeking more innovative ways to integrate appliances under their kitchen counters. Wine coolers have not been left behind; they are a sophisticated addition into your classy home. Better kitchen organization: in-built appliances make kitchens look less crowded and organized. A built in wine fridge will make your kitchen neater because you do not have to bump into other items when using it. Constant temperature: wine coolers offer the optimal temperatures for wines to mature. Inbuilt coolers are meant to keep your wine in the best condition to acquire a superior taste. 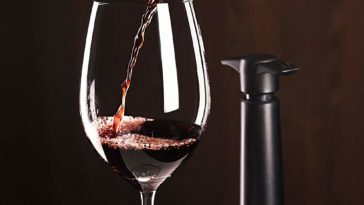 Proper humidity levels and UV protection: humidity is key to keeping the cork on your wine bottle active. Inbuilt wine coolers have a cup with water that keeps the inside of the cooler humid. This protects the wine against evaporation. Built in wine cooler models also come with double tempered glass doors to keep UV light out. 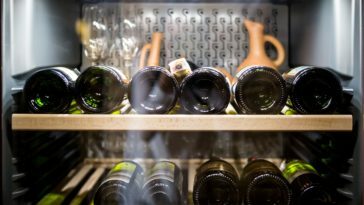 Size and capacity: when choosing the size of your cooler, you first need to assess whether you are a casual wine drinker or a connoisseur wine collector. Small models can hold 6 bottles with the largest holding up to 200 bottles. You also need to consider the availability of space to put the cooler in order to purchase one that will fit there. Traditional or thermoelectric: thermoelectric coolers are quieter and cheaper as compared to compressor models. 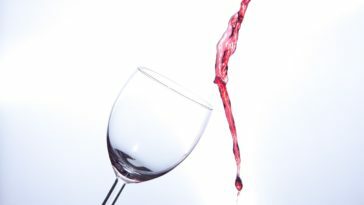 They are also more energy efficient although they can only cool wines up to 20 degrees below the room temperature. Compressor models, on the other hand, are stronger and hold temperature better. They also vibrate louder as compared to the thermoelectric ones. Single or dual zone wine coolers: single zone coolers store wines of one color since they have one cooling temperature and space that is not divided. Depending on the temperatures needed, they can store either white or red wine not both. Dual zone coolers maintain two separate and distinct temperature zones, meaning that you can store a mixture of both colors of wine. Construction: if you want your cooler to complement your kitchen, choose one with a steel finishing or a color that can blend with the rest of your house. The door should be double layered and UV filtered to keep UV rays from your wine. The interior shelves should also be made from strong materials to last long. Basic shelves are made from chrome wire while premium brands are made from beech wood. 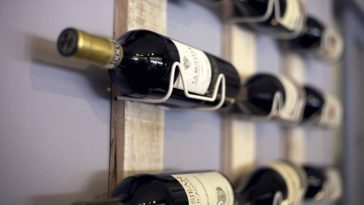 It would even be more convenient when the shelves are adjustable and can roll out to make it easier to access your wines. The interiors should also have a light for easy display of your collection. Some models even have lights that stay on even when it is closed. This would be great for people who like to show off their wine collection. 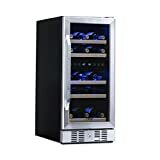 This is among the top rated wine coolers that I came across. Able to store up to 30 750ml bottles, this cooler can be used freestanding or inbuilt depending on how you would want to keep things in your kitchen. Tempered double layered reversible glass door: this helps to stabilize the temperatures by preventing the formation of fog, thus allowing you to see the inside. The door is made of stainless steel for increased durability. It is reversible to allow you to save more space since you do not have to worry about the door’s orientation. It does not block anything in your kitchen. Smart LED temperature control: this feature makes it easy for you to set the temperature as required. The temperature memory functionautomatically restores the preset temperature when there is a power outage. Additionally, the cooler uses a blue LED light to keep your wines away from UV rays. 6 beech wood sliding shelves allow air to circulate better in the interior. 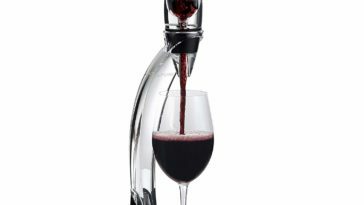 This keeps all your wines fresh and chilled regardless of their position in the cooler. Hexagonal security lock: to keep kids out of the cooler. Any wine enthusiast will appreciate the convenience and advanced cooling technology that comes with the Kalamera 15″ wine cooler. 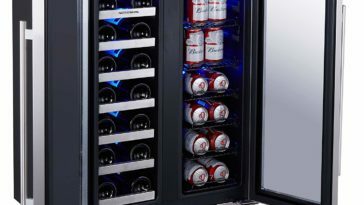 If you are willing to spend more on a good cooler, this might just be the choice for you. A good recommendation for a quiet efficient cooler is what it is. The NewAir Dual Zone cooler is a compressor cooler but regardless of this, the manufacturer made it quiet. It is so quiet that you have to listen carefully just to ensure that it is working. Temperature control: temperature control is enabled by the user-friendly buttons on the unit. It controls temperatures for the two zones and the LED display screen allows you to monitor this. This cooler can hold temperature constant, meaning that you will not see any fluctuations. Lock capability: the lock helps keep people and children out of your cooler. It is just a basic lock that makes it a little more difficult to open, which means that it is only efficient at keeping kids out. Removable and adjustable shelves: the cooler has five beech wood shelves that slide out easily when you need to retrieve or stock your cooler. You can increase or decrease the height of the shelves accordingly, especially when storing large wine bottles. Adjustable feet: when installing the cooler, stabilizing it is very important to prevent rattling and vibrations. The feet under this cooler are adjustable to allow you to make it as stable as it needs to be. Moisture control: two cups come with the cooler. They are meant to control the interior moisture content. The larger cup acts as a dripping tray for the cooler while the smaller one is used to hold water to help with humidity inside the unit. This is the ideal wine cooler for people looking for a quiet dual zone cooler. The two temperature ranges also allow you to store both types of wine. If you have a collection, this can be a worthy buy. Are you looking to combine class and functionality in a cooler? If you are, this might just be the machine for you. 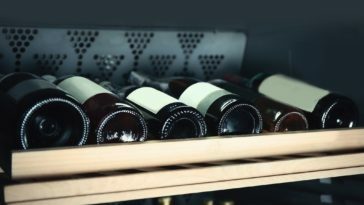 Phiestina cooler has five shelves with the ability to hold up to 29 wine bottles. It has a simple remarkable design and superior finish that will leave your guests envious. Its steel body is easy to clean and increases the durability of your cooler. It can be used in different orientations depending on your preferences. Made of stainless steel: stainless steel is highly durable in addition to looking classy. Additionally, this simply designed cooler has two exterior choices: a steel exterior that allows it to blend in lighter interiors and black for darker settings. Thick transparent glass door: the transparent door allows you to show off your wine collection to your guests. An LED lighting system is available when you open the door. 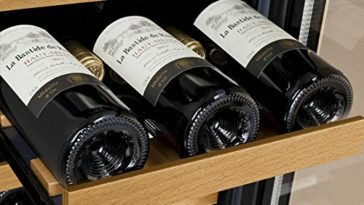 Sliding interior shelves: it has five sliding shelves that can hold four to five bottles of wine each. 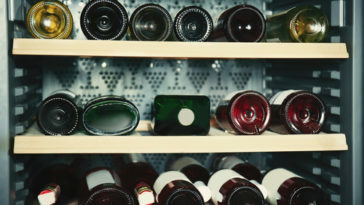 The shelves are easy to remove, thus making it easy to reach all wines. Technical features: the cooler has a premium compressor system for cooling. A smart control circuit is used to maintain the inside temperature even when it is not running. Temperature control is enabled by a press button unit located at the center of the cooler. There is a digital blue LED readout that displays the temperature. 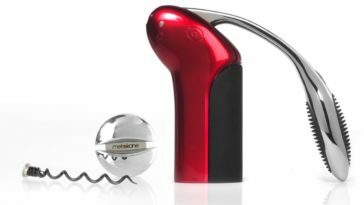 Moreover, it has a dual zone design that allows you to store white and red wines. The upper zone can go as low as 40-50 degrees F while the lower can attain 50-66 degrees F.
Size: measuring 14.9″ x 22.4″ x 33.9″, it can be placed on the counter, used as a standalone, or be integrated into your kitchen unit. This gives you the convenience to use it however you would like depending on your kitchen space. 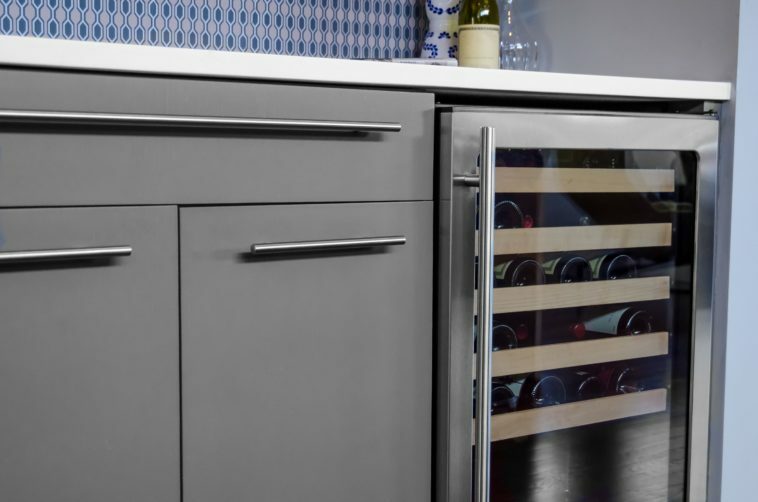 If you want to enhance your kitchen’s elegance while still having a cooler that can comfortably show off your wine collection, this could be a great choice for you. With its elegant finish and design, this baby will blend seamlessly with your other appliances. 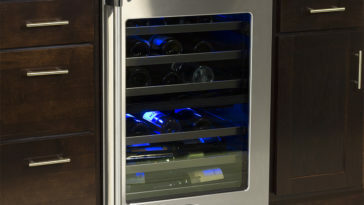 You will need a wine cooler to make sure that your wine collection is well kept. 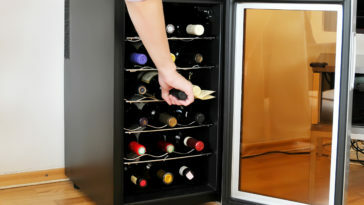 A built in wine fridge can be a solution to the limited space that most people have to contend with in their homes. Not only does the cooler add sophistication to your house, it is also convenient and helps you saves space.